Finding that elusive pot of gold for a migrant family can be tough; the journey demands sacrifices that often stretch across generations. Nisa’s younger brother, A, enjoys playing with candle wax. This is an activity he indulges in when the family brightens up the house with candles in times of blackout. A plays with candle wax. This is my fourth time doing fieldwork in Ponorogo. Each time I arrive at a different time of the year. This time – November – I am experiencing a change from the dry to the wet season. The showers and gradually the thunderstorms that greeted us in the late afternoons over the last five days I have been here have provided much respite from the scorching hot weather. Unfortunately the thunderstorms also bring about blackouts, which may stretch for three to four hours at a time. Villagers are well prepared – all of them are armed with candles, torches and portable lamps. Ibu Siti (the auntie who offers the ARI fieldwork team accommodation) and her neighbours are engaged in their usual evening prayer routines in the front hall of the house despite the lack of electricity. 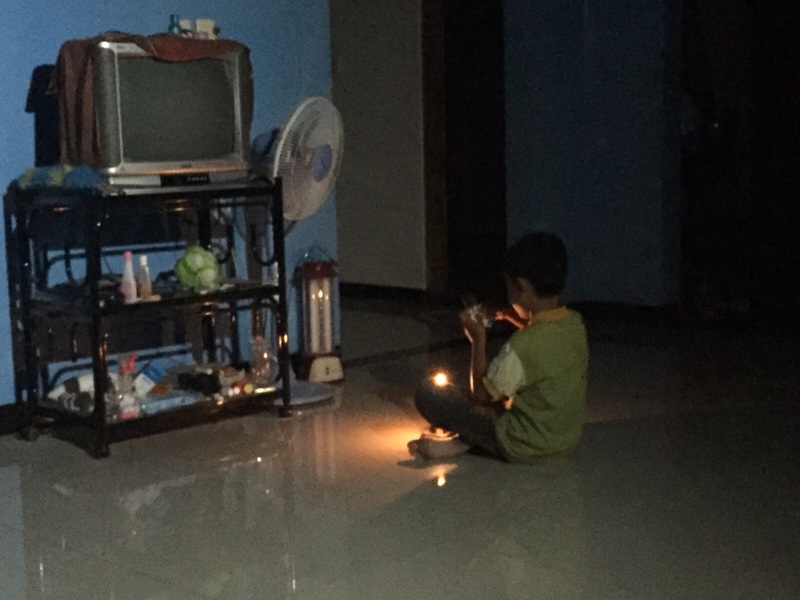 Nisa says that blackouts are common during the rainy season. Strong winds uproot trees, which then fall on overhead electrical wires, affecting electricity supply to homes. Other than blackouts, Nisa and her family also have to factor in the lack of water into their lives. 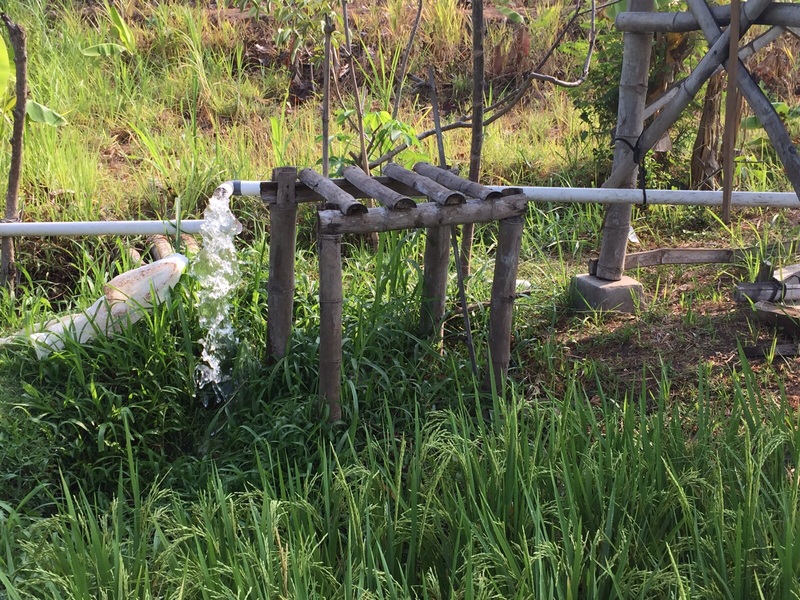 The dry season brings about competition for piped groundwater between households and agricultural plots. As a result, if the field pipes are installed deeper into the ground than the nearby households, most of the groundwater might be directed to the fields in times of prolonged dry weather. Then the tap at home runs dry. When this happens, Nisa and her family take showers and do their laundry at her aunt’s house, about 200 metres away. Other affected households do their laundry at the open pipe in the fields where water is continuously gushing out to feed the crops. Water gushing continuously into the padi field. It is about one month to harvest. Perhaps the thunderstorms might bring the water supply back to Nisa’s home if the farmers decide that they do not need to rely on piped groundwater to nourish their prized crops. In Ponorogo, Nisa and her family put up with the inconveniences that changes in the weather bring. A few thousand kilometres away, Nisa’s father also endures harsh weather conditions to build a rainbow for his family. Nisa’s father has been working overseas, mainly as a construction worker, since she was one year old. She is now 15, on the cusp of turning 16. Using the remittances accumulated from his migration, Nisa’s father has built the beautiful two-storey modern house that Nisa, her brother A, and her mother currently live in. He has recently made what is to be his very last outmigration to Brunei Darussalam, as the family expects his return (for good) in 2017. 2017 is also the year that Nisa is due to graduate from SMK Kesehatan, a pre-tertiary educational institute where she specialises in nursing. Nisa dreams of going to the university to further her education, but her father’s impending final return implies that the family will not be able to afford supporting her education after her graduation from SMK. She expresses little confidence about getting a university scholarship. Nisa demonstrating the use of the stethoscope and blood pressure machine on her brother. There are many stories like Nisa’s in Ponorogo. 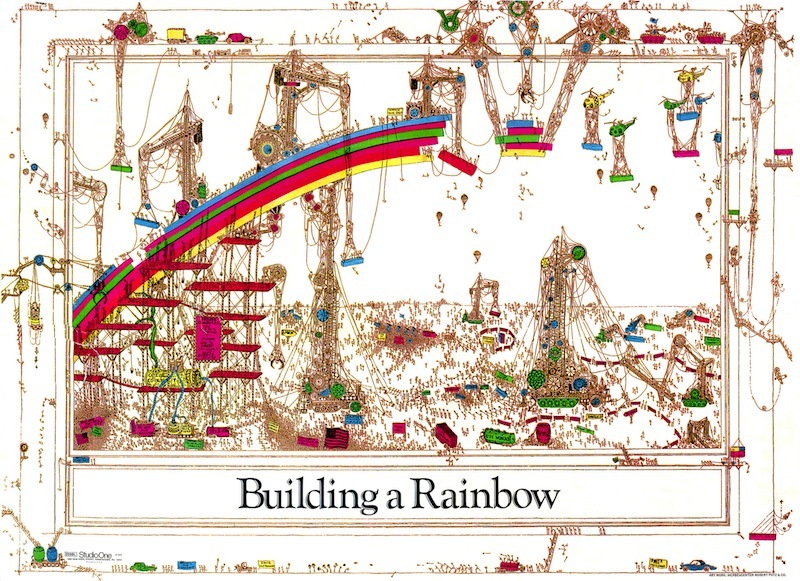 The rainbow is a work-in-progress across generations. Low-waged, unskilled labour migration undertaken by parents is often sufficient to fund their children’s (pre-tertiary) education for as long as they work overseas. Nisa was able to attend the three-year SMK Kesehatan course precisely because her father decided that he would undertake (yet) another work contract in Brunei lasting the same period. But he’s getting old, and university school fees are much more expensive, so a post-2017 migration stint might not produce sufficient remittances to fund Nisa’s current education anyway – much less a university degree. If Nisa decides to migrate overseas for work, she can undertake skilled labour migration as a nurse, hence starting out with greater human capital gifted by her father’s long-term, low-waged, unskilled labour migration. Indeed, working after graduation from SMK seems like an economically attractive option for both herself and her family, where she can save up to fund a deferred university education in nursing, and perhaps even fund her brother’s education in the long term. According to Nisa, her school offers hospital work placements in Indonesian cities as well as overseas, in countries such as Hong Kong, Taiwan and Singapore. When the father returns, it is up to Nisa to continue building the rainbow for the family. Hopefully Nisa and her family find the pot of gold at the end of the rainbow soon so that they can enjoy a family reunion that has been long in the making. We are currently in Ponorogo, filming the stories of the youth here and their aspirations for the future. The film is scheduled to be released in mid-2016. Butigan, Ken. (2011). “An emerging force for peace”, from Waging NonViolence website (http://wagingnonviolence.org/feature/an-emerging-force-for-peace/). Accessed November 10 2015.